More and more attention is paid to the use of ICT and more specifically, social software, for improving the social inclusion of Youth at Risk. This was also recognised by the European Commission that organised in 2007 a special Framework Programme 7 call for projects on this subject. 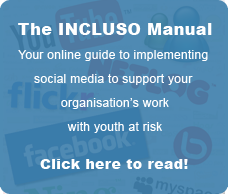 The collaborative INCLUSO project (Sept. 2008- Sept. 2010) responded to this concern as it aims to deliver a verifiable proof that ICT, and more precisely, social software tools, can facilitate social inclusion of youth at risk. INCLUSO, after an initial phase of desk research, currently has four pilot projects running in 4 countries. The practical conclusions will be bundled in a Whitebook together with a business and sustainability model for actions implementing ICT in the area of social inclusion. 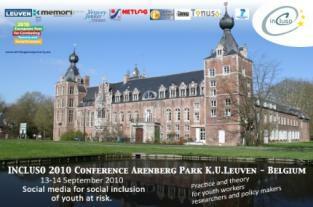 On 13 and 14 September 2010, INCLUSO organised in Leuven (Arenberg Castle, Heverlee-Belgium) an international conference on eInclusion of Youth at Risk gathering international specialists in the field of social software use and improvement of social inclusion for disadvantaged youngsters. Delegates from decision making groups such as governments and the European Commission were present and discussed research and policy options for the future. This research and policy note is available for download at: http://www.incluso.org/sites/default/files/Research and Policy note.pdf.